The transition from print to digital modes is going on all around us, changing how we work, teach, and learn. Colleges and universities are re-examining their digital literacy strategies, hoping that students who come to college steeped in consumer technology will be transformed into able producers and contributors of digital content by the time they graduate from their technology-supported academic programs. Leaders at Clemson University's Center of Excellence in Digital Creativity have taken an all-or-nothing approach: Nearly 30,000 students and faculty all have access to all the software tools in the Adobe Creative Cloud, along with an impressive collaboratory filled with high-end hardware, collaboration tools, and expert guidance. CT talked with Jan Rune Holmevik (below, left), Associate Professor in the Department of English and Co-Director of Clemson's Center of Excellence, and with April O'Brien (below, right), a Ph.D. student in Rhetorics, Communication, and Information Design and a Graduate Teacher of Record at Clemson. Mary Grush: For years, we've heard questions on most campuses about how to address digital literacy. Is the discussion different now? Jan Rune Holmevik: Yes, it has changed over time, from a focus on acquiring basic computer skills to consideration of much larger questions. We've recognized that consumption and production of digital content are two different things. There's a parallel in the print world: You're not really literate if all you can do is read. You can get by, but you are not going to be able to participate fully in your community and society unless you can both read and write. The same is true in the digital world. Gregory Ulmer, a theorist at the University of Florida coined the term electracy to describe this broader notion of digital literacy. At universities we are all more aware now of the growing significance of digital literacy, as we are seeing a widespread transition from print to digital and an accompanying transformation of teaching and learning practices. Grush: Was there a strategic push from upper administration to emphasize digital literacy at Clemson? Holmevik: No, we do emphasize digital literacy at Clemson, but this was not a top-down strategy on our campus. Our initiatives at Clemson have grown out of a lot of faculty engagement with creative tools plus the support of our CIO, Jim Bottum. There was no mandate from the provost's office or the president's office to invest in digital literacy, though they are happy to see what we are doing. Grush: Was there an event or driver that fueled your efforts? Holmevik: Yes, one in particular. Faculty in certain departments — English, for example — had started to use digital tools and media in creative work many years ago. More recently, in May of 2013, Adobe announced that it would move its suite of creative tools exclusively to the cloud. For us, that meant we could no longer install the software on specific lab computers. Faculty who had been incorporating digital creativity tools in their courses, and using them in the labs, were very concerned that the new model was going to mean that we would lose access to those creativity tools. The new cloud pricing structure did not seem affordable, and we clearly needed to negotiate with Adobe. Clemson CIO Jim Bottum is a visionary in education, so we went to him for help. He saw this as an initiative that was important for the university as a whole. 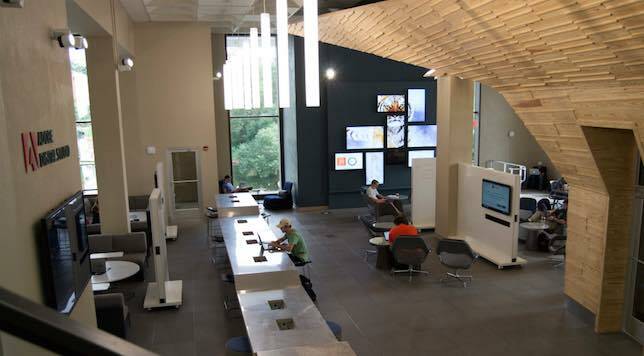 What resulted was the expansion of the university's Center of Excellence to include a Digital Creativity focus area. 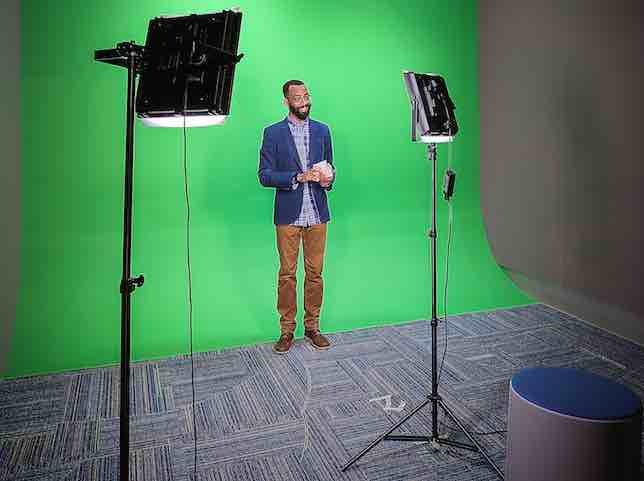 By October, 2015, we saw the official opening of our Adobe Digital Studio (below) along with access to the full Adobe Creative Cloud for all students and faculty. Grush: Is there an advantage to Clemson that helps position this as such an inclusive, institution-wide initiative? Holmevik: We have just taken the step into the top 20 public universities, and an effective digital literacy initiative certainly gives us a competitive edge to climb even higher. Still, the ranking is one thing, but importantly, the main consideration is the true impact for students — like April, who's here with me today — and the reality of what they will be able to do after they graduate. Grush: April, a relatively short time ago you were faced with selecting a college program. Did the availability digital tools and creative technologies at Clemson affect your college choice? April O'Brien: I don't think I was aware, until I actually visited the campus, of the kind of opportunities I would have here. So, I applied to Clemson, but not because of knowing about the access I'd have to creative digital tools. But after being extended an offer I came to Clemson for a campus visit. I was able to see that the Adobe Digital Studio was in the works. I talked to students in my future program — and I found that they had been using digital tools extensively. I knew right then that Clemson was the best choice for me, and I moved it to the top of my list. Grush: Did you feel prepared to work in a technology-infused environment? Was it going to be worth the effort you would have to make? O'Brien: I have to say, I did have a sense of trepidation about that, at the time, because my background was very traditional and print-based — I was, what was then, a typical "English literature person". I came to Clemson knowing that I would be stretching myself, but I really wanted to do that. I also knew that learning the software, and developing my ability to work in a digital environment, was going to separate me, ultimately, from the many, many, students entering the job market with me in a few years. Grush: I noticed that there is a program called "All In". Is this how you can make all of the Adobe Creative Cloud products available to all Clemson constituents? Holmevik: "All In" is a program we pioneered with Adobe. The regular pricing structure for Adobe Creative Cloud is $19.99 per month per student. When an institution has close to 30,000 students and faculty, as we have, it's easy to see that it's just not going to be practical to provide full access at scale. So, the purpose of All In is to allow universities and very large institutions a way to offer large-scale access. Since establishing All In, we have helped Adobe bring in additional partners. The hope is that many universities will be able, like us, to offer full access to all the Adobe software for all their students and faculty. Grush: Besides the access to software, is it important to have a "place" where students and faculty can work if they choose? Holmevik: Yes, one of the things we wanted from the beginning was a space for just that, so that people could "see" a physical manifestation of the project and find out what it means to be a next-generation learner. As it happened, the library had moved out some older collections and had some space available. Our vision was to create a collaboratory in that library space, our Adobe Digital Studio. In a way, it is similar to an Apple store, where you walk in and can experience all the technology. There are screens everywhere that display student work via Behance. You can get inspired by being in there, seeing the creative examples, and, best of all, you can begin to create for yourself. 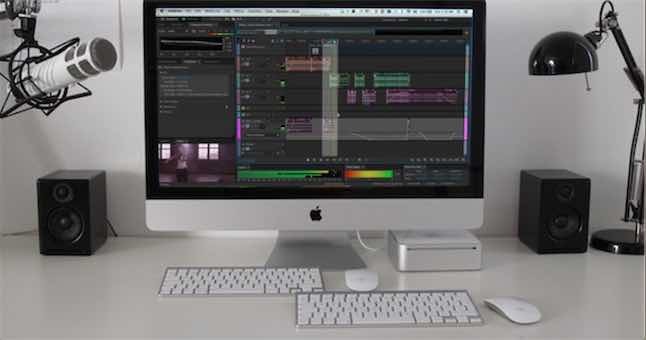 Besides the access you have to the full Adobe Creative Cloud software, there are numerous production technologies available for anyone to use — for example, a green screen studio with a one-button video recording system and a high-end audio recording station (audio equipment pictured below). Plus, we included the Creativity Bar, which is analogous to Apple's Genius Bar. It's staffed with interns who are familiar with the Adobe products and the hardware and are there to help you. O'Brien: I was able to use the Adobe Digital Studio last year as a student, and I now also have my own students use it. I have them go to the library and tour the space, making sure they know that it's there for them to use — it's not for some other, more special students. My students learn about how to use all the technologies themselves — including the green screen (pictured below) and the recording studio — and they learn how to sync their laptops to display screens for collaborative work. By the end of the term, they do a required final video project. An important part of digital literacy is knowing how to solve problems if you are faced with any technology issue. There are staff available to help students learn how to fix their own problems (not to do it for them). There is a difference between being digitally native and digitally literate. My new students find out quickly that their high degree of facility with cell phones and social media is simply not enough. Their work in the Adobe Digital Studio helps them bridge the gap. They sometimes get a little annoyed with me, but I just have to keep them in there, even when it's hard for them, and reassure them that their work will benefit them. Grush: What about the curriculum at Clemson overall? Is digital literacy built into the curriculum campus wide? How would you organize that? Holmevik: That's the question we'd all like to know the answer to! Getting the software here on campus and available to everyone was the first big step, and it was a really, really big step. So now that we have the digital tools, are we just going to leave everything else to chance, or are we going to have a big, strategic plan, with a vision behind it? The stakes are high. We really do need to look at the curricular side and the implementation of these technologies in the classroom. The Center of Excellence is committed to helping faculty implement digital creativity and digital literacy into any course. We can provide support — there is a training group that works with us; we put together retreats and bring people together; we have a Digital Creativity Faculty Program, the one that April is part of in her teaching; and we produce PR materials so that other faculty may see what their colleagues are doing and be inspired by it. We definitely want to focus our attention campus wide. So far, we've had our biggest impact in the arts and humanities, and in architecture. From that, we are trying to map out next steps. Next academic year, we are exploring a support-and-incentive program for the faculty in our freshmen composition program. That program catches every incoming freshman in the entire university — we'll be able to expose them to digital creativity at a very early point in their college careers. That way, we both support faculty and set higher expectations in the students. Grush: Given the scale of the Adobe software on campus, and all the related initiatives, that must be quite an investment for the university. When are you going to be able to show ROI? Holmevik: Not in the first year. We are going to need a much longer runway than that. We are really talking about changing a part of the wider education establishment, which has not changed itself fundamentally in 200 years or more. This type of change is going to take a long time, and we need to remind everyone to be patient. We live in a world that is fast-paced, and of course technology changes quickly. But in academia, we see change at a snail's pace. Teaching faculty and departments each have their own set of priorities. Our focus now is to support faculty who really want to be empowered with digital creative tools, and make the biggest initial impact we can. Remember, traditional literacy took more than 2,000 years to develop. So, when we're thinking about digital literacy, we are not going to have results right away. But, I'm very confident that our work to scale up digital literacy is the right thing to do.